This article is about the region of Vvardenfell. For other ashlands, see Solstheim Ashlands and Stonefalls. The Ashlands region was the largest contiguous geographical region on Vvardenfell—a dry, inhospitable wasteland characterized by clusters of stone obelisks; minimal, highly-adapted vegetation; and bubbling ash mires. It encompassed land from the Urshilaku Camp on the northern shore of the Sea of Ghosts, west to the Redoran Council seat Ald'ruhn, then south to where the slopes of Red Mountain leveled off into the lava fields of Molag Amur. The southern border ran on an approximate line from Foyada Mamaea, near Balmora, to the southern border of the Grazelands. 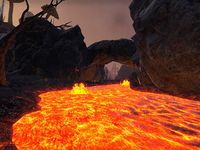 The mountainous region to the southeast of Molag Amur was sometimes considered part of the Ashlands because of the similarity of its ecology, but was generally flatter, with open lava flows. Also, the slopes of Red Mountain itself were a separate region, bound by the Ghostfence. Frequent ash storms limited visibility and spread the Blight, affecting almost every creature found in the region. Only the western part of the Ashlands was under permanent control of House Redoran. The shrine in Maar Gan was an important Temple pilgrimage site, and the village's houses volunteered militia for the fight against the forces of Dagoth Ur. The nomadic Ashlander tribe of the Urshilaku hunted for game, foraged, and their herds found sparse grazing around ragged tent villages in the far northwest, but there were small Ashlander camps throughout the area outside the Ghostfence. The rest of the region was embattled with infractions of rogue Telvanni, bandits, and even vampires trying to gain a foothold. 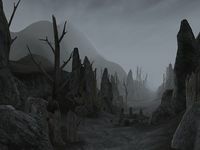 The interior of the Ashlands was thus largely devoid of permanent, occupied settlements, with the citadel of Ghostgate being the major exception. This was due to the lack of water and vegetation in the area, as it rarely ever rained. Scattered throughout the land were various caves, eggmines, Daedric and Dwemer ruins, and wizards' towers. The Ashlands were presumably destroyed at the beginning of the Fourth Era due to the eruption of Red Mountain. For game-specific information, see the Morrowind article. This page was last modified on 20 January 2019, at 16:58.